On May 8, 1945 Nazi Germany surrendered, ending what would later be called the Second World War in Europe. For the next 45 years, the victorious Soviets and their erstwhile Atlantic allies faced off across the line dividing Europe, two global empires capable of annihilating humanity, angling for power and prestige based on the legitimacy they drew from defeating Hitler. Sixty years later, as a remnant of the now-defunct Soviet Union marked Victory Day (May 9, when the surrender came into effect on Moscow time), triumph over the Nazis was overshadowed by controversy kicked up by the American Empire and its allies along the Russian border. It was a reminder of how much the world has changed since 1990  and nowhere is this more true than in the Balkans. Anniversaries of 1945 have brought out much of the acrimony that still underlies political life in the successor shards of Yugoslavia. April brought the 60th anniversary of the desperate breakout from the largest death camp in the region, operated by the Croatian Nazis  though disproportionate coverage was given to the Croatian ceremony, which minimized the number of victims. Just as that controversy appeared to be cooling off  though far from being resolved, obviously  another came along. On May 9, a descendant of the WW2 Serbian royalist leader, Gen. Draza Mihailovic, received an American decoration that had been kept secret for decades. Zagreb and Sarajevo reacted with sound and fury, while official Belgrade remained rather sedate. But the storm of protests and counter protests laid bare the ugly truth that World War Two in the Balkans is far from over. Mihailovic, commander of the Royal Yugoslav Army in the Homeland (as opposed to the royal government, which was in exile), was issued a Legion of Merit medal by President Truman in 1948 for his contribution to the royalists’ rescue of American airmen shot down over Serbia. Operation Halyard was the largest behind-the-lines rescue in American history  yet it had been classified for decades because the U.S. did not wish to antagonize the communist government of Yugoslavia. The medal itself was awarded posthumously, as Mihailovic had been captured by the communists, given a speedy show trial, and executed in 1946. Moreover, it was never actually issued to anyone, for the same diplomatic reason. The U.S. stopped caring about offending Yugoslavia in 1992, when it backed its disintegration. However, the concern then shifted to the sensibilities of Croatia and Bosnian Muslim authorities, both of which consider not only Mihailovic, but all the royalists, to be war criminals. This is why the medal was eventually given to Mihailovic’s daughter by American veterans, in a private ceremony in Belgrade, amid a near-complete U.S. media blackout. In the wartime chaos of Yugoslavia, there were Nazis executing 100 Serb civilians for every German soldier killed (50 for every soldier wounded) by any guerrillas; a genocidal state in Croatia with a program of mass extermination, expulsion, and forced conversion of Serbs that would horrify even the Germans; Albanians who had annexed Kosovo and the surrounding areas and were busily "cleansing" them of Serbs; Muslims who joined the Nazis and Croats, urged on by the Grand Mufti of Jerusalem; communist partisans who were fighting against the Germans but also for establishing a post-war communist society; and the Serbian royalists ("chetniks") who fought against both the Germans and the communists while trying to combat the wholesale slaughter of Serbs in today’s Croatia, Bosnia, and Kosovo. The conflict between communists and royalists was particularly brutal. Families and friends turned on each other, and Serbs killed Serbs over ideology even as the Germans, the Ustashe, and others did plenty of Serb-killing on their own. Eventually the communist partisans, with the help of Soviet forces and support of Western Allies, prevailed over the royalists. The new regime accused Mihailovic and his men of collaborating with the Germans and massacring civilians  communists, as well as Croats and Muslims. "Chetnik"  an old Serb word for guerilla  became a synonym for quisling, given moral equivalence with the Ustasha. When communism started crumbling in the 1990s, royalists did not emerge as the power in Serbia. They lacked both an agenda and coherent leadership; Vuk Draskovic, the current disastrous foreign minister, imagined himself as a leader of the royalist movement. Radical leader Vojislav Seselj also claimed leadership of the resurrected "chetnik." Only a few Serbs fighting in Krajina and Bosnia called themselves chetniks and wore royalist insignia  but to the Croat and Muslim governments, all Serbs were "chetniks," and all were genocidal criminals. In Serbia itself, the conflict between the royalists and communists seems to have calmed down, with the recent official recognition of the royalists as a legitimate resistance movement. Amid the pompous declarations of "Croat" and "Bosnian" anti-fascism, most Serbs still remembered that the country both the communist partisans and the royalists fought for was called Yugoslavia. Prime Minister Vojislav Kostunica chose to mark Victory Day by paying tribute to both movements, at the monument to Yugoslav pilots killed defending Belgrade from the Nazi attack in April 1941. 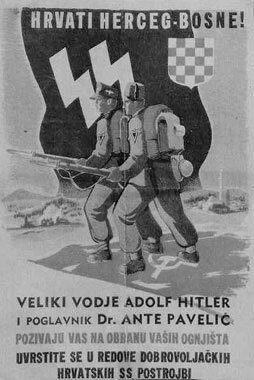 One cannot resist the impression that the volume of howling coming from Zagreb over Mihailovic is directly proportional to modern Croatia’s determination to deny, cover up, and spin the nature of wartime Croatia as a genocidal state allied with the Nazis. Zagreb appears to know the ropes of modern politics, where this kind of outrageous deception usually triumphs over truth. It is certainly a hypocrisy that political heirs of the Ustashe and the prime destroyers of Tito’s communist Yugoslavia now claim to be defenders of Tito’s legacy. The only part of that legacy the currently ruling HDZ ever cared for were the generously drawn borders of the Croatian republic, which to their great distress encompassed all too many Serbs. That is, until Franjo Tudjman’s new independent state of Croatia completed the work begun by Ante Pavelic 50 years prior and engineered a decidedly final "solution" to that particular problem. Then again, he had better allies than Pavelic. And now Tudjman’s successor is criticizing those very same allies for a symbolic gesture of recognition to a man long dead, who was helping Americans while the critic’s ancestors fought for Hitler at Stalingrad. The same yardstick could be applied to Bosnian Muslim protests. Muslim politicians are quick to proclaim that their enemy in the most recent war was "fascism resurfaced" from the last  implying that their soldiers also fought for the legacy of Tito’s partisans. Why, then, have they renamed all the streets that used to bear the names of Muslim partisans (let alone Serbs, Croats, or others)? How do they explain the 13th Waffen SS Mountain Division "Handschar," or the 23rd Waffen SS Mountain Division "Kama"? 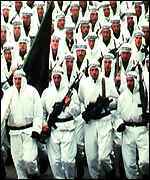 Or that so many of their 1990s "partisans" wore white shrouds of jihad fanatics and howled "Teqbir! Allahu-akbar!" before human-wave charges? Perhaps the Muslim firebrands, who relish in labeling all Serbs "Chetniks" and accusing them of fascism, ought to remember the mountains of evidence of Muslim involvement with the Ustashe and the Nazis. World War Two is regarded as the "good war" in the West, and the "Great Fatherland War" in the East. In the Balkans, it should be regarded as a period of tragedy and carnage, from which no one emerged virtuous, and hardly anyone victorious. As usual, politicians have less use for facts than for perceptions. World War Two has become the great wellspring of legitimacy, which everyone  even and especially those allied with the Nazis  dips into at need to satisfy modern political agendas. This is not limited to the Balkans. In Europe, the factual narrative of the war seems increasingly irrelevant. The former Soviet Baltic republics (often confused with the Balkans by the ignorant) for example, are proud of aiding the Nazis. To them, communist occupation and oppression were the real crime of the 20th century. The Atlantic Empire doesn’t seem to mind, and actually demands an apology from Russia. It’s a strange world, 60 years later, in which American forces occupy parts of Serbia, while Italy, Hungary, Romania, Bulgaria, Albania, Croatia (and Bosnia)  all once allied with Hitler  are now allies of Washington, and the map of Imperial influence in Europe uncomfortably resembles the situation in 1942. It is a world in which, regardless of the frequent dips into the legitimacy well, it matters far less who served or resisted the Nazis in 1945 than who serves or resists the Empire now. Previous Previous post: Neocons Exploiting Domestic Unrest in Iran?